Holy crap we're in Slovakia! After an overnight in the capital city of Bratislava, we took the train to Handlova - birthplace of Meghan's grandmother. 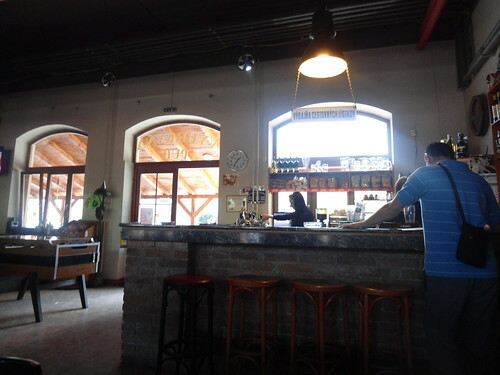 Vrútky was where we changed trains, and the station conveniently housed this charming pub! Here is a short video of me confirming that yes, indeed, that is a pub. Note the New Order concert t-shirt from three nights previous. The pub itself was surprisingly busy, and surprisingly good. I drank my first strong Slovakian beer: a Martiner. A half-pint cost only €0,60... the same as what Meghan paid for her soft drink! This Czech-style lager is brewed in Slovakia by Heineken. Through some Slavic sorcery they manage to cram 12% abv yet only 138 calories into each bottle.